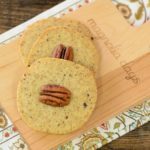 A recipe for coffee crisps that are thin crispy cookies made with instant coffee granules and are a great pick-me-up treat any time of the day. Whisk together flour, coffee, baking powder, baking soda, and salt in a bowl. Cream shortening and butter in a large mixing bowl. Add sugar and brown sugar and beat until light and fluffy. Add egg and rum and beat until combined. Add dry ingredients and mix until just combined. The dough will appear crumbly. Divide dough in half. Push together each half and roll into logs 2 inches in diameter. Wrap each log in wax or parchment paper and chill overnight. Preheat oven to 400 degrees F. Line baking sheets with parchment or non-stick liner. Remove paper from dough logs and cut dough into 1/8 inch slices. Place slices 1 inch apart on baking sheets. Gently press a pecan half into the center of each slice. Bake for 7 to 9 minutes, until the edges are light brown. Watch the cookies beginning at the 6 minute mark and be careful not to over-bake. They will brown very quickly. Immediately transfer cookies to a wire rack and cool completely. Cool cookie sheets completely between batches. Time stated above does not include chilling dough overnight.